If you are looking to rock one of the hottest trends this prom season, choose from this assortment of beautiful two piece dresses. 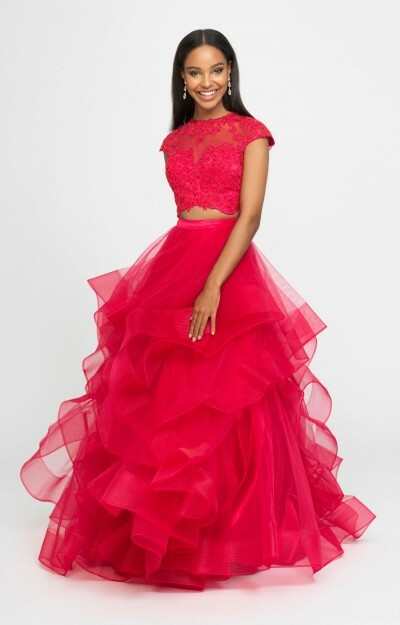 Whether you are needing a short dress to wear to homecoming or a long gown to sport to prom or a military ball, this collection of two piece formal dresses will have just what you need to look great and feel confident. For homecoming or a cocktail party, try a short black bodycon two piece with lace detailing that highlights your figure for a modern take on the classic little black dress. Have a more formal event coming up? Browse through our two piece prom dresses to choose from white floral two piece gowns and blue mermaid styles with dazzling beadwork and a fun layered skirt. Shopping on a budget? This collection also features a variety of two piece styles with cheap prices.